Welcome back to my blog and "God Fortsättning" of the new year. During my Christmas leave from school my good friend Lesli that is responsable for programming Lagmansnatursida have found some beutiful nature photographs that we are allowed to use and written comments to these. We plan to make an English version of "Picture of the Day" and the blog. This is the first attemt. Here in Västergötland, it is very mild and we don´t not need so much firewood as we did in december. But one must be careful not to think that this is something typical in our world. According to Snow Lab / Rutgers University more than 50 million square km of Earth's surface was covered by snow in the last week of december. It is not far from the record. It is only in our part of the world that it is different. It will be interesting to see how the rest of the winter unfolds. 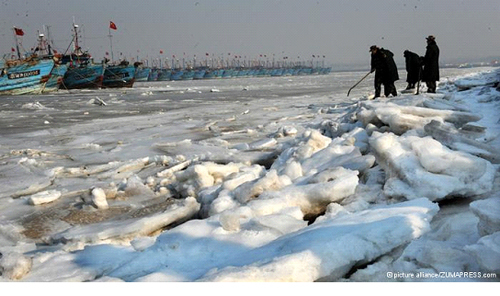 Cool ice pictures from China at this link. Northen China has experienced vey cold weather. It was several decades ago, it was so cold in northern China. Eastern Russia is very cold also. Despite the chill in Russia some are still out there to fish. A type of catfish. In New Delhi, it has not been so cold in the last 44 years, even if it is not below freezing point according to the BBC. 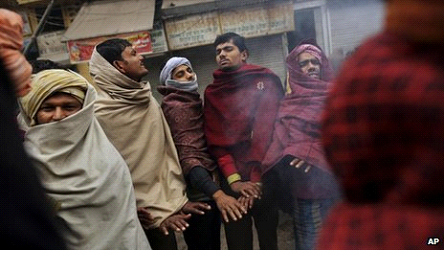 Over 170 people have frozen to death in India, many in the countryside outside New Delhi. The lower limit of the average temperature in January is 11 degrees. Now it was about 2 degrees. This has been a common sight in New Delhi during the beginning of January.